Toys R Us has released an extremely rare printable coupon that will save you 15% off your entire regular-priced toy purchase at your local store! This is a great way to beat the Black Friday craziness plus grab some super deals on items that rarely go on sale. You can use this printable Toys R Us coupon on Legos including the Advent calendars that are impossible to ever find on sale!!! This would be great to use on other Lego sets too. Many of these sets are pricey and 15% off can really save you some money! Also think about other popular brands that are on your must have gift list this holiday and cross them off at a discount. This is much less stressful than fighting the crowds. This saves you time and money! This 15% off Printable Toys R Us coupon is valid in-store only today November 21st and tomorrow, November 22nd. 2014 Entertainment Books only 2/$20 with Free Shipping! There is a really hot deal going right now on 2014 Entertainment Books! Get two books for only $20 with free shipping! That makes these only $10 per book shipped which is a huge discount from the regular price of $40 or more! Entertainment Books are a great way to save on restaurants, groceries, entertainment and more. These are great to buy for your vacation destination as well and can save you you tons on dining! Save $3.50 Off $10 Purchase at Sally Beauty Supply! There is a really rare coupon available right now to save $3.50 off $10 purchase at Sally Beauty Supply! I love shopping at Sally! They have great salon quality products at great prices! My go to item to purchase there is dry shampoo which is often on sale for around $5 a can. You could use this coupon to save $1.75 off of each can when you purchase two! Also, right now you can enter for a chance to win up to $12,000 in prizes from Sally! This is a great sweepstakes where you nominate a friend and if you are selected you both win a prize! Finding a Chasing Fireflies coupon code is very rare. However, right now you can get 20% Off on any order with the coupon code FNF14. This coupon code works on any order! This Chasing Fireflies coupon code will expire at 11:59 p.m. ET on Monday , March 31, 2014. Chasing Fireflies has lots of beautiful boutique clothing including lots of adorable clothing for Easter. Looking for more online coupon codes? Be sure to check out our online coupon code database! If you have any more toy shopping to do, don’t miss out on these great printable toy coupons. Stack these with a sale and you have bargain gift! You may want to even pick up a few extra for birthday parties throughout the year. 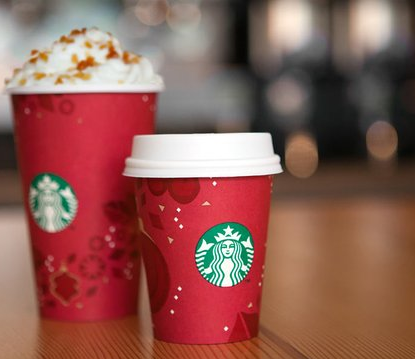 Here is a great FREE Starbucks Kids Hot Chocolate coupon! With Amazon Local (free to sign up) you can get a printable coupon for a FREE Kids’ Hot Chocolate from Starbucks with Purchase of Any Espresso Beverage! The coupon is good for an eight-ounce kids’ hot chocolate with purchase of any espresso drink. Get Your Starbucks Coupon Today! Thinking of shopping this weekend? Don’t head out the door without these great printable Retail Store Coupons! One easy way to get coupons is to sign up on company email lists. Here is a great offer to join! You will receive both Carter’s coupons and and OshKosh B’gosh coupons. Plus you will receive exclusive offers from both companies. When you sign up you will get a Carter’s coupon and an Osh Kosh coupon good for 20% off in store or online within 24 hours. Both these store already have great prices and 20% can make for some great deals! Join the carter’s family today for exclusive offers, coupons, sneak peeks & more. Sign up now! Think of shopping this weekend? Don’t head out the door without these great printable Retail Store Coupons! Need to do any back to school shoe shopping or summer sandal shopping? Then you may want to print this coupon Shoe Carnival to use instore or online. Take $10 off of every $50 spent up to $40 off $200. Get your Shoe Carnival coupon and you can either shop in store or online. 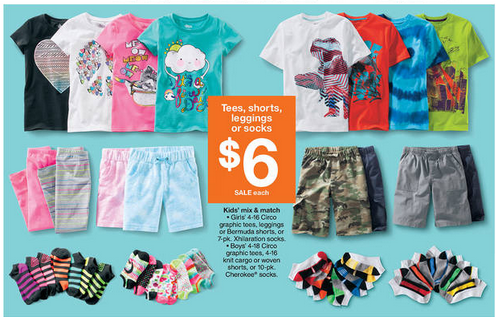 Back-to-School with all the great deals at Shoe Carnival. Get your coupon now! I was so excited to see this new printable coupon for the Coach retail store and it is for 25% off! Coach Coupons for the retail store are fairly rare. You will need a Facebook account to grab this Coach Coupon. Don’t want to head out to the store, then check out the Coach Factory Online Store. They are having an amazing sale right now plus you can get an additional 50% off there as well. Coach Factory Online is a private event and the only place online where you can purchase authentic Coach Factory Product. Accessible by invitation only, they periodically offer special savings on limited Coach Factory products. Sales are for a limited time as communicated by the offer. There are some amazing deals with this sale. Plus shipping is FREE on orders $150 or more. I have some invitations I would be happy to give out to readers. If you would like one, you fill out the form below. Usually, you will not be able to participate in the current sale but will be ready for the next one. Here is a great new Starbucks coupon and you can even just show it on your mobile phone. Head over to Starbucks Facebook page to claim an offer for $1 Grande Iced Coffee, Iced Tea, or Starbucks Refreshers. Click the “get offer” tab and the offer will be sent to your email. You may have to scroll dow a bit to see the offer it is no longer right on top. Be sure to check both the right and left hand columns. 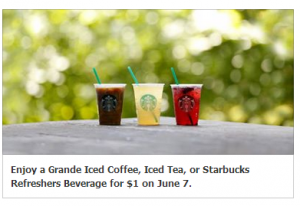 The Starbucks coupon is valid only today June 7, 2013 only! Need some new shoes for spring and summer for you or the kids? Don’t pay more than you need. Grab this 15% off Famous Footwear coupon. Do you know they carry twinkle toes shoes? I have some great twinkle toes styling options coming up soon. You can get 20% off your entire purchase at Michaels Craft store with this printable coupon today through April 21, 2013. This printable coupon work on your entire purchase including sale items too! This is a great time to pick up items for summer crafts and activities. Did you know that they will also now accept mobile coupons? Instead of printaing the coupon you can have to it texted right to your phone. You can just pull the coupon up on your smart phone and they will scan it at the check out. I LOVE this. I have used it several times and it was very easy. They also have an app that is wonderful since the coupons are always right there on your phone. The app is avaiable for the iPhone or Android. Printable Retail Coupons – Barnes & Noble, H & M, & More! 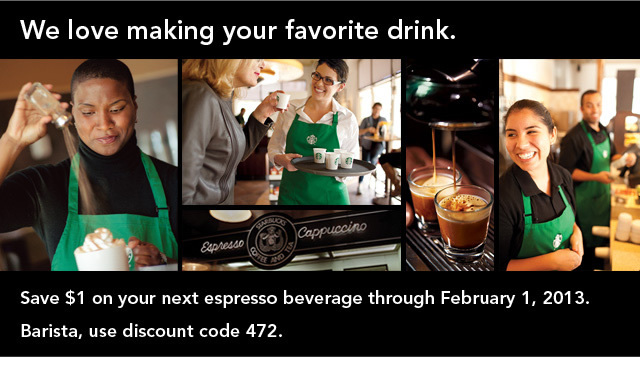 I loving this new $1 Off Starbucks Espresso Beverage Coupon! Through February 1 at participating stores, save $1 on your next handcrafted espresso beverage. Just print the coupon or show it to a barista on your mobile device. Top Printable Retail Coupons – Ann Taylor Factory, Gap Outlet & More!